FATflammation is a chronic, silent, and dangerous inflammation that takes place in the fat cells themselves. The more bloated fat cells become, the more weight people gain, which spurs an unrelenting cycle of increased fat cell inflammation and weight gain. Breaking this vicious cycle is key to losing and keeping off the excess weight. In How to Fight FATflammation! 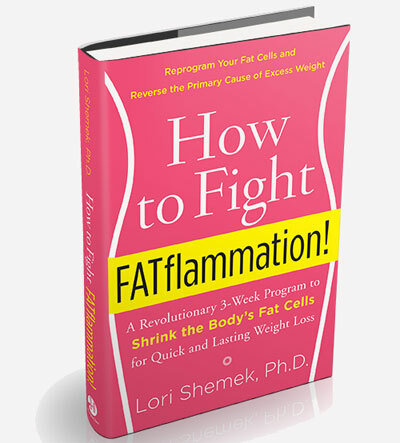 Dr. Lori Shemek lays out her very easy three-week program that helps you reboot your body chemistry by returning your body’s fat cells back to their natural, healthy state. By changing the way fat cells operate, the FATflammation-Free plan trains your body to naturally stop your fat cells from over expanding. As your body begins to reduce the cell inflammation, your fat cells heal and unwanted pounds melt away. You’ll find tons of information that makes losing weight easier than it’s ever been.